There's a different way to see Canada by train and it doesn't even involve a boarding pass -- just 23 photos. The Canadian: Ghost Train Crossing Canada began as personal project for photographer Jeff Friesen after the Halifax resident became a father. "I first started getting into miniature photography after my daughter was born because all of a sudden I had miniature animals and things around the house. One day, I was at a hobby store and I saw these model trains and thought it would be cool to have one of those trains in real scenery," Friesen told The Huffington Post Canada. That idea quickly became a hunt for a very specific model train: The Canadian, a vintage 1955 streamliner, what Friesen calls a "ghost from from another age". The Canadian: Ghost Train Crossing Canada. Story continues after the gallery. "I started searching around to see if I could get this train and there was this company in Toronto, Rapido Trains, that makes and sells [the Canadian]. But the trains were made in a limited edition and they were all sold out but I phoned the president of the company and he sold me a demo version at cost." Prior to 1955, The Canadian actually ran from Toronto to Chicago but now runs from Toronto to Vancouver since Via Rail took over the line in 1978. 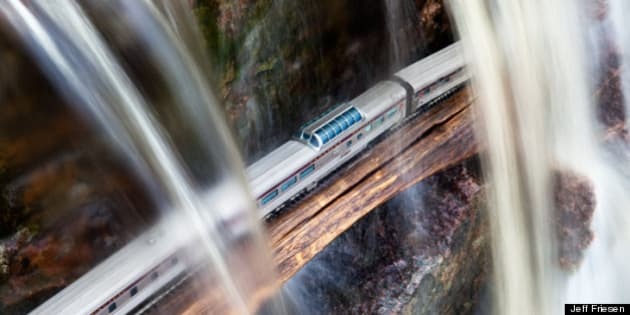 It was during a trip from Victoria to Winnipeg last fall that Friesen started photographing his replica of The Canadian, setting up shots of the nine-foot, 10-cart train over waterfalls, moss-covered logs and wheat fields across provinces. "I find the photographs memorable not because of how good they are but because of the train nearly getting destroyed. There was a time where the some of the carts fell from a log into a stream and I was running through the [water] trying to catch the train and they started to sink and then I was this mode of panic," said Friesen with a laugh. "Things like these happen all too often and I just hate bringing out the train sometimes", he added. Friesen's project has taken him to eight of Canada's provinces, including parts of Southern Ontario and Quebec and the photographer says he has his eyes --and train -- set on Newfoundland as his next location. Despite the painstaking work it takes for each photo (it takes Friesen about an hour to find a location and level the miniature train tracks), he says it's all worth it. "In a way I like it because it's difficult and at least the hard work has gotten some recognition. It'd be hard for someone to copy-cat this project."